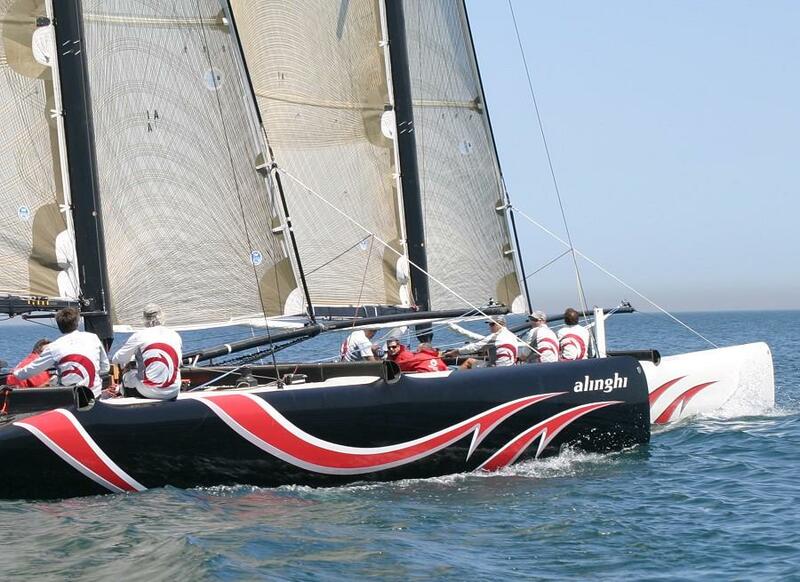 John Barnitt rejoined Alinghi, as Sports Director, early this year, having been a member of Alinghi�s winning team in Auckland. Barnitt was also a member of Dennis Conner�s Stars & Stripes team for the last of the 12 metre Cups and the catamaran defense. Barnitt�s present role is to keep the sailing team on track towards a common goal and to provide communication and feedback between the sailing and design teams. Later he expects to also be integrating with the shore, weather, administration and marketing teams. We began by asking him about the possibility of SNG winning an appeal that would result in the reinstatement of CNEV as Challenger of Record. 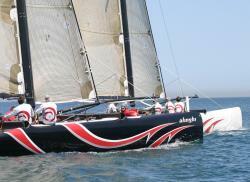 BYM News: This morning everyone seems to be assuming that there will be a multihull match in 2009, but Cahn might rule it is going to be this year and, secondly, SNG has appealed, so it might end up with CNEV being Challenger of Record after all in which case there wouldn�t be a DoG match. So, why are there no apparent plans, other than the assumption it will be DoG, in 2009? The most difficult part of this has been not knowing and every time there was some new piece of information it seemed to provide more questions than answers. So, there came a time to ask ourselves whether we wanted to go on living in that middle ground, or make a choice and make the best of the circumstances we find ourselves in? That�s what we are trying to do. BYM News: So you aren�t saying that you�ve given up hope of a multi-challenger event? No, what we are saying is that there is a good chance that we will have to defend in a large multihull and that�s a very long, very difficult, very expensive project especially given the amount of time we have now. If we wait for clarity, we will be in no position to defend, one way or the other. What I�ve done, in my position, is to make a conscious decision that I will focus on the area where my core competencies are and they are not in the legal aspect of this. We have team members whose core competencies do lie there, so you have to say �Let those guys work on their disciplines, this is what we do.� We have an obligation to the Geneva Yacht Club and we need to do what�s right by that. BYM News: You are presently sailing 35, 40 and 60 foot boats; how long will you have to adjust to a 90 foot boat and how good is the experience you are getting now in preparing you to sail the really big one? As Ed pointed out, every day that we sail multihulls is a good day, whether it�s the D35s in Geneva, the Extreme 40s in Valencia, the Alinghi 41, or sailing with Alain on Foncia. Every day we learn, we debrief, we write it down and we think about the next step. We are also giving information to our design team, those aspects are well linked. BYM News: There�s been talk that BMW Oracle has installed some very sophisticated gear on Groupama 2, to gather computerised data, are you doing the same thing? We are gathering certain information, such as load measurements, but I don�t know what BMW Oracle is doing. I don�t think anyone does, so I wouldn�t like to say whether their data gathering is more sophisticated than ours, or not. BYM News: Last time you were involved in a multihull challenge it was no big deal, because Dennis could have gone out in just about any multihull and beaten the big boat, so there was no real challenge. I disagree. When, at that time, had anyone sailed a 70 foot catamaran with a solid wing mast? BYM News: But there was still no hope that a monohull could compete with a catamaran. That�s very true; the fact is that, in the Michael Fay challenge, the big boat was already in construction and those boats take a very long time to design, so there was no hope of us building a competitive monohull. I think what that series of events showed was that the New York Courts were not so much based on intent as on the letter of the Deed of Gift. If you look back, you�ll find that there was a lot of time spent on not having to do that America�s Cup, because it locked everyone else out, same as this does. That said, you still have to go out on the water and sail and we had never sailed that sort of boat before, so we had to learn about it and that is where I think the parallels are. 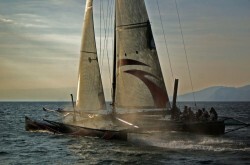 BYM News: A lot of people think that BMW Oracle will just go out and hire Cammas & Co to sail the match. What hope does Alinghi have of really learning in a year what Cammas has been learning for more than 10 years? It�s a good point and I guess we�ll find out. One thing that we need to remember though is that most members of the large multihull fraternity have gained most of their experience in offshore sailing and, in the Deed of Gift, there�s no question of what the race course is and it is not what they are used to. In a Deed of Gift match, you have to sail the course as it is, but the multihull guys sail from continent to continent and, if the wind shifts, they follow a different course. If they sail 15 degrees lower for a few hours, because the wind has shifted, that�s no problem, but when you are sailing round the buoys you don�t have that luxury and you have to react very quickly to wind shifts. So, in some ways, they�ll have to learn as much as we will and, when you look at it from that stand point, it�s a fresh piece of paper. That said, we�ve got some very good guys, but are we on our back foot? Yes, we are. BYM News: What happens if the match is in October 2008? Then we are in a really tough spot. We spent so much of our time, energy and resources designing a rule for a monohull that included the rest of the teams. BYM News: Final question; let�s suppose Brad is right and someone who wins the America�s Cup in a big multi doesn�t want to go back to monos, Would that mean no more multi team events because sponsors would consider it too expensive? Personally, I�ve no idea. My philosophy has always been to take each America�s Cup as it comes and try to do a really good job, not thinking about the next one. Next: the design team talks of lead mines and fast multis.